Leave the kadaifi in the freezer for about 1-2 hours prior to use. Then, take it out and crack it into small pieces. Take it to a pot and add butter and sugar. Cook stirring constantly over medium heat until it gets pinkish. Stir in walnuts/pecans and turn the heat off. Let it cool. 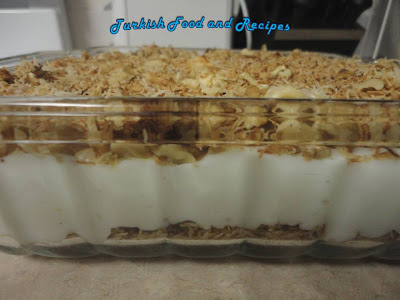 Click for the recipe of Turkish Milk Pudding (Muhallebi). Let the Muhallebi cool and add whipped cream. Mix with a mixer until it gets smooth. 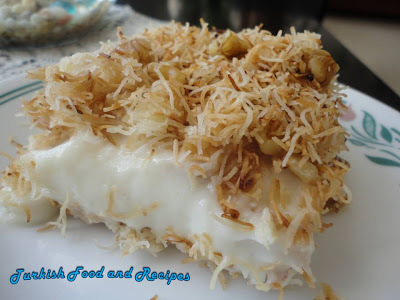 Take the half of the kadaifi mixture over a rectangular big Pyrex dish and spread the Muhallebi over. Finally spread the remaining kadaifi mixture over. Cut in square slices and serve. Kadayifi 1-2 saat kadar derin dondurucuda bekletin. Dondurucudan alin ve kirarak kucuk parcalara bolun. Tencereye alin, tereyag ve sekeri ilave edin. Orta ateste surekli karistirarak rengi pembelesene dek kavurun. Cevizleri ilave edin. Ocaktan alin ve sogumasini bekleyin. Muhallebinin yapilisi icin tiklayin. Muhallebi soguduktan sonra icine krem santiyi ekleyip mikserle karistirin. Kadayifin yarisini buyuk dikdortgen borcama yayin. Uzerine muhallebiyi doseyin. Kalan kadayifi uzerine yayin. I just want to grab a piece. How beautiful this dish came out....congrats! I wish I could help you but I do not have any idea about replacing kadaifi (shredded dough). However, the plain custard is delicious too.